Vietnam’s national payment for forest environmental services (PFES) policy has been implemented for more than five years, during which time forest managers have received payments from private sector companies to improve forest quality and support local livelihoods. 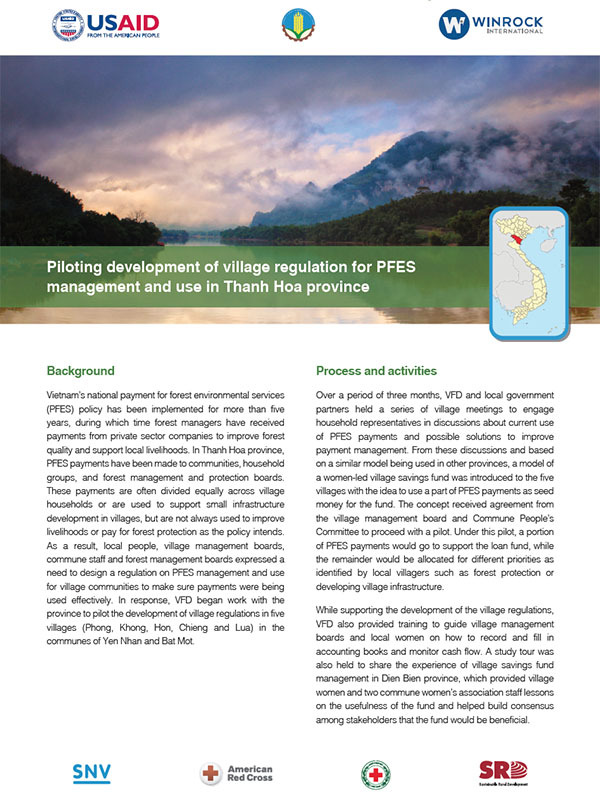 In Thanh Hoa province, PFES payments have been made to communities, household groups, and forest management and protection boards. These payments are often divided equally across village households or are used to support small infrastructure development in villages, but are not always used to improve livelihoods or pay for forest protection as the policy intends. As a result, local people, village management boards, commune staff and forest management boards expressed a need to design a regulation on PFES management and use for village communities to make sure payments were being used effectively. In response, VFD began work with the province to pilot the development of village regulations in five villages (Phong, Khong, Hon, Chieng and Lua) in the communes of Yen Nhan and Bat Mot.